Published on Friday, March 25, 2016. This article appears in the February/March 2016 issue of American Craft Magazine. As the 21st century turned, Karen Hampton got wind of some long-lost family documents, revealing ancestors she never knew she had. Her work hasn’t been the same since. In the documents, Hampton discovered one of her forebears, a woman named Flora. Born a slave in Florida in the late 1700s, Flora had her freedom – and 500 acres of land – by the early 1800s. George J.F. Clarke, the son of British settlers, bought her and granted her freedom, and together they had eight children. Clarke also ensured the children’s freedom, educated them, and left them, collectively, an inheritance of 33,000 acres of land. Flora’s Daughters (2002) is Hampton’s portrait of her ancestor, pictured in a collared dress with an ornate hat. Hampton laid silk organza over muslin to suggest Flora’s transition from slave to landowner. 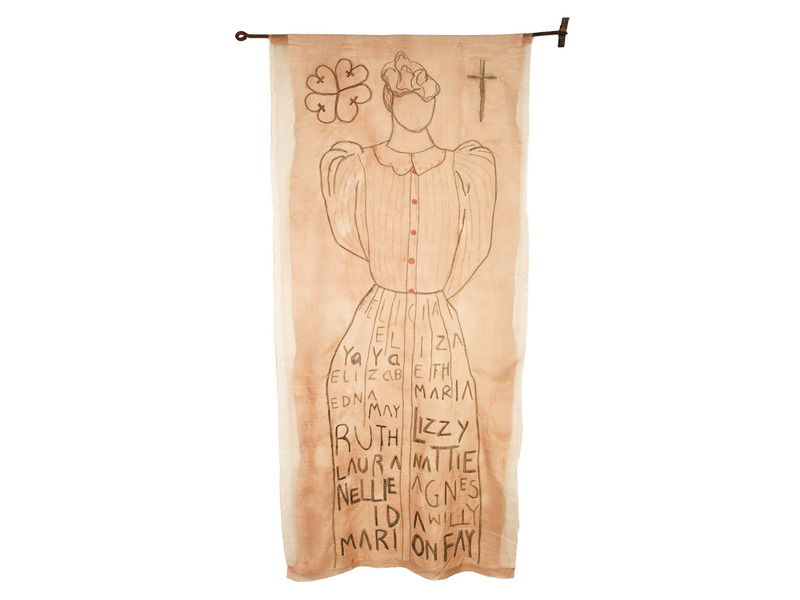 Using indigo and cotton weaving yarn, she inscribed on the skirt the names of some of Flora’s female descendants: Felicia, YaYa, Eliza, Nattie, Elizabeth, May, Maria, Ruth, Lizzy, Edna, Agnes, Nellie, Laura, Ida, Willy, Marion, and Fay. These women would come to confront racism as they defended the family’s land rights well into the 20th century. 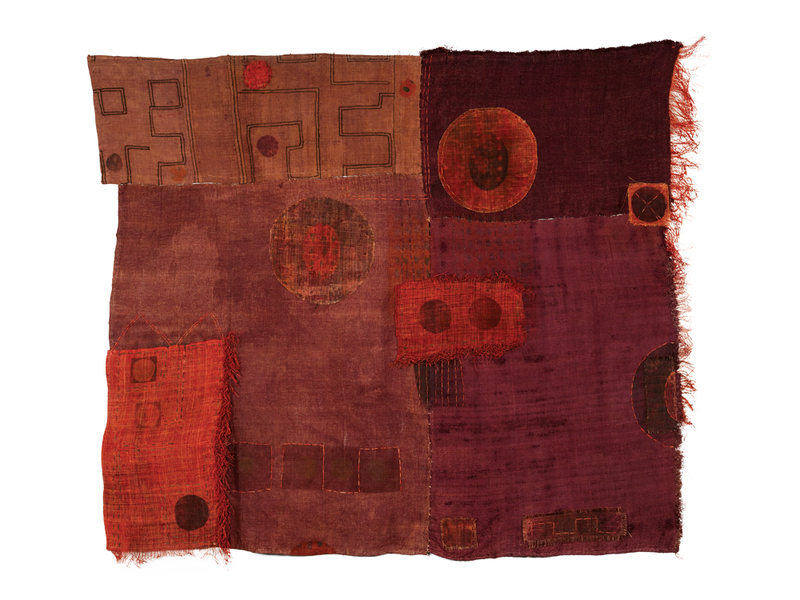 The piece is just one example of how the Los Angeles-based artist weaves together difficult historical and personal truths in her complex, startling textiles, using a broad array of materials and techniques, from natural dyeing to digital photo printing on fabric. 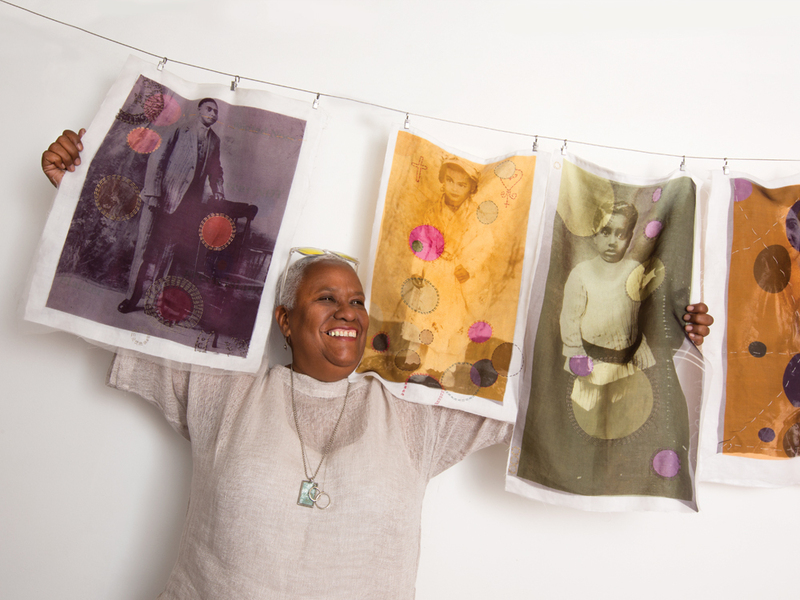 Through both art and scholarship, she seeks to honor and examine African American history, with an eye toward healing. 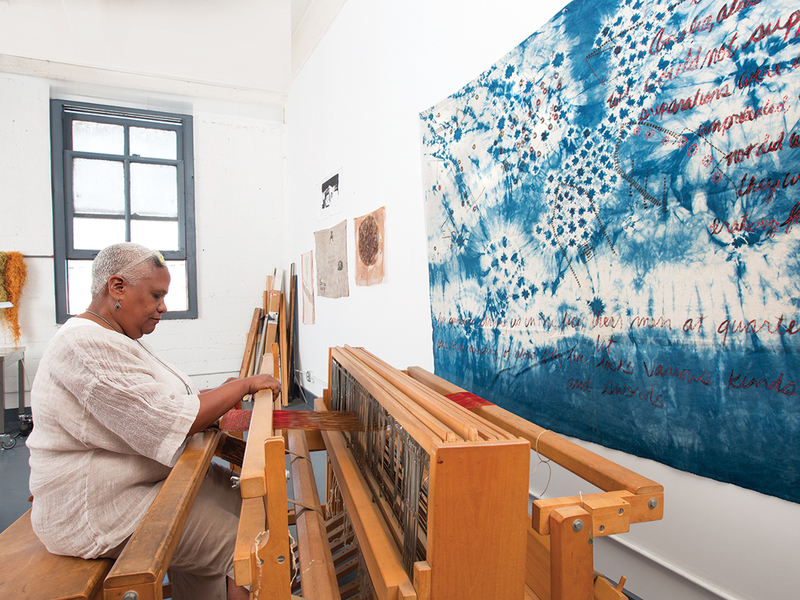 “Each time my weft crosses the warp or my needle pierces the cloth, I reach through another layer of scorched earth that slavery has left behind, and I attempt to reframe the issues of race that haunt our modern lives,” she wrote in a paper, Stitching Race, for a Textile Society of America symposium in 2012. Hampton grew up in a middle-class neighborhood in Los Angeles during the civil rights movement. She was among the first group of children in California selected for a desegregation busing program. She attended school in the affluent Bel Air neighborhood, where all of the children, aside from those on her bus, were white. Hampton’s parents divorced when she was 10, and her mother became an alcoholic. Her grandmother and her great-aunt, already her primary caregivers because both parents worked, became even more important. At home, drawn to craft from a young age, Hampton learned to sew and embroider. In high school, she embroidered all of her clothes, in keeping with ’70s style. At 17, she left Los Angeles for Oakland to attend Laney College but stayed only a year. She then taught art at various venues and made rag rugs and jackets, a project she later abandoned after disappointing sales. In the late ’80s, she returned to school to study art and anthropology at New College of California in San Francisco. 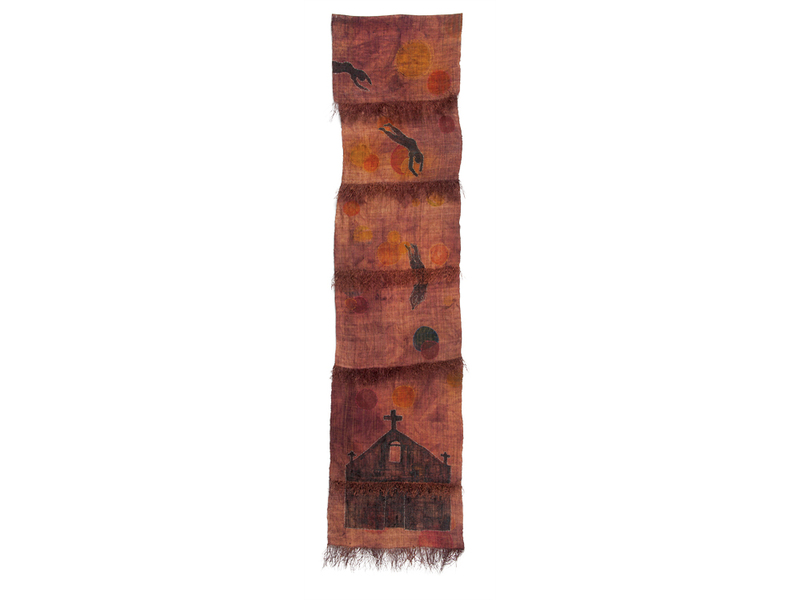 After college, she apprenticed for a year and half with Ida Grae, a master weaver and a leading authority on natural dyes. After graduating from New College in the early ’90s, she decided to focus on her artwork, even if she couldn’t make a living at it. “After that, everything was an investigation of what was true for me,” she recalls. But after a divorce, she struggled to balance her ambition with raising two sons as a single mother. 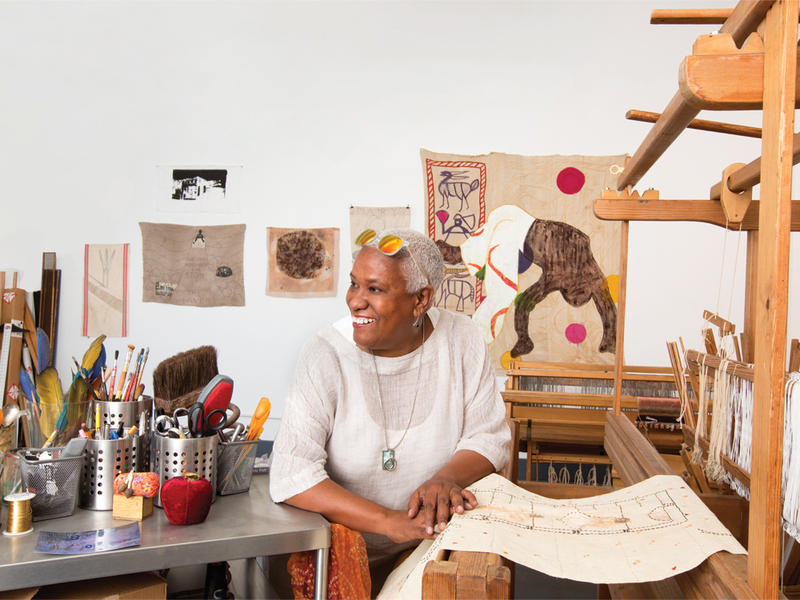 Living in an artists’ warehouse in Oakland helped, and she kept her artistic practice steady. Her decision to go to grad school came in the mid-’90s, after she attended a textile conference and found the same dismaying lack of diversity she had noticed 20 years before; out of 500 attendees, only four were African American – especially disappointing since African textiles were a major topic on the program. Around the same time, after a lecture she gave on her work, someone asked, “Why is it that I see looms only in white people’s homes?” The question haunted her. “It was like an epiphany,” she says. She realized she could research the subject in grad school, and she decided to focus on slavery and African American textile history at the University of California, Davis. As she studied slavery, Hampton used her art to respond to its legacy. 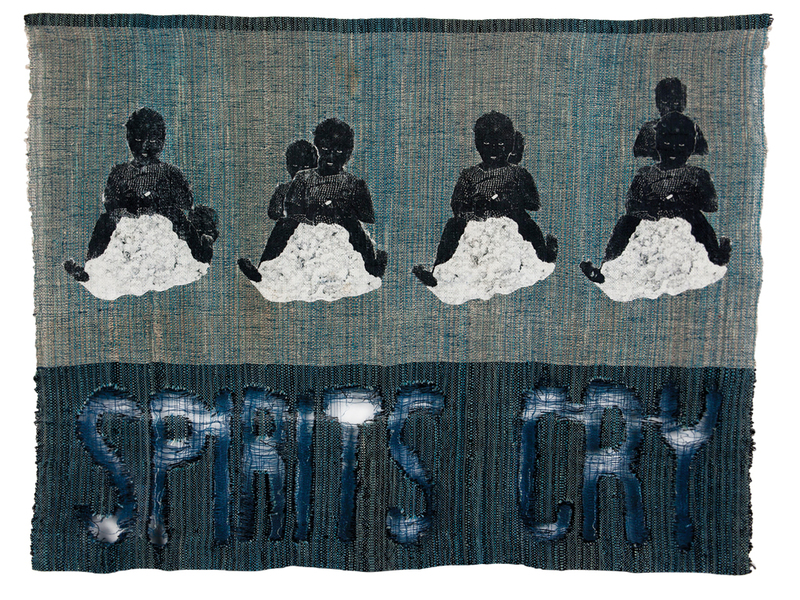 In 2000, she created Spirits Cry, with images from early 20th-century postcards of African American babies sitting atop bales of cotton. 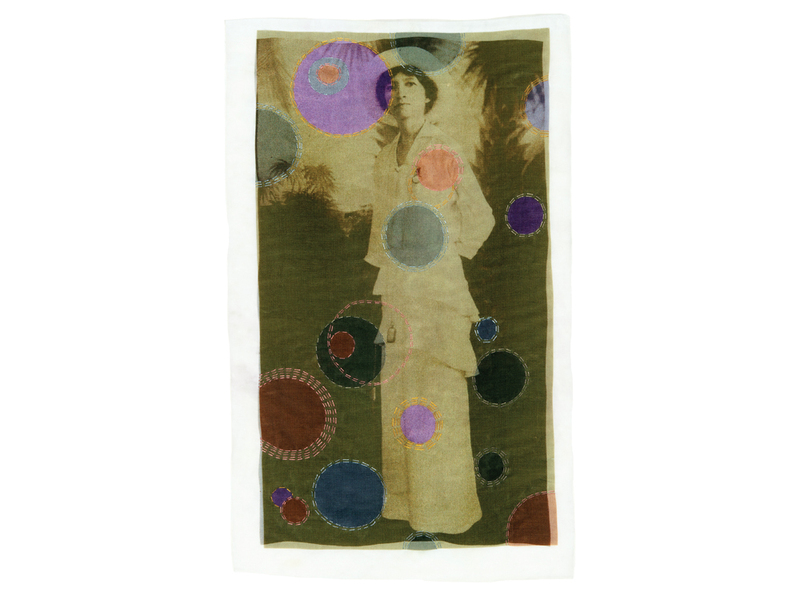 She applied the images with transfer liquid onto woven and indigo-dyed linen and cotton. 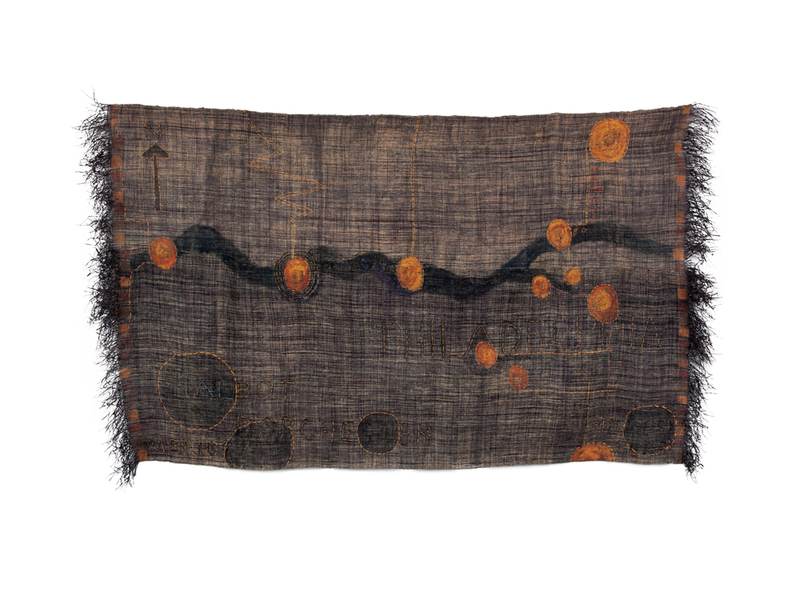 The title of the piece is burned into the bottom with devoré, leaving ghostly, tattered threads and gaping holes. “It’s all about the children crying,” she explains. Her studies prepared her well to research her own ancestors; as luck would have it, the centuries-old family documents came to light shortly after her graduation. Finding threads of inspiration in their stories became a cathartic journey for Hampton that lasted more than a decade. 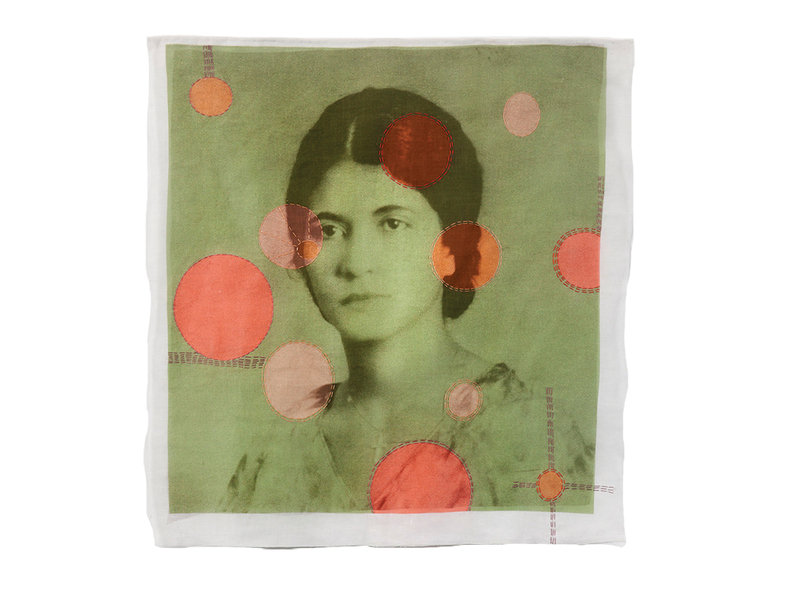 She made numerous portraits, incorporating archival photos, stitching in text from period documents and using fabrics and dyes that were true to the era. Last year, when she was offered a solo exhibition at the Ruth and Elmer Wellin Museum of Art in Clinton, New York, Hampton expanded her historical research to abolitionists, since many had lived in the region. 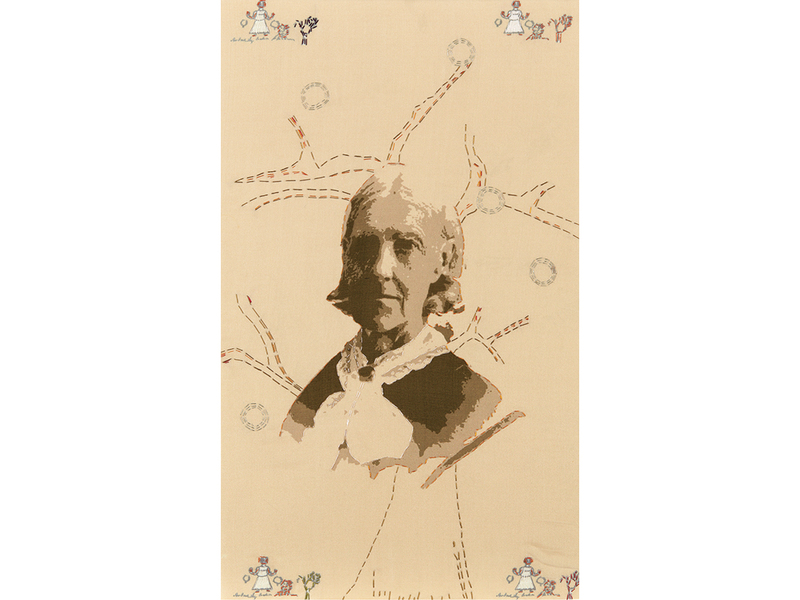 Her portrait of Angelina Grimké (2015) includes a photo digitally printed on two layers of fabric – a technique she adopted in the late 2000s – as well as hand-stitching of small, playful cartoons and tree branches stemming from Grimké’s face. The cartoons are based on the announcement of Grimké’s 1838 wedding to fellow abolitionist Theodore Dwight Weld. Hampton’s work has been in numerous group and solo shows over the past decade, but she started attracting major recognition only in 2008, when she received the Fleishhacker Foundation Eureka Fellowship. In 2015, she was a resident artist at the Sacatar Foundation in Brazil, where she studied Brazilian culture and history, including Brazilian lacemaking traditions.